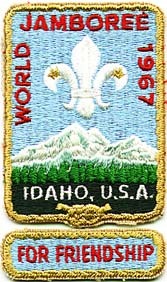 Farragut State Park, Idaho, U.S.A. 12th World Jamboree and the second in North America. 12,011 campers from 105 countries. Theme: " For Friendship". Arena shows, Skill-o-Rama, Adventure Trail, aquatics on Lake Pend Oreille, reconstruction of B-P´s Brownsea Island Camp, thrills and spills of a real Western Rodeo and all in the splendour of the Rocky Mountains. Visits by Lady B-P and U.S. Vice President Hubert Humphrey.